If you had diabetes or cancer, would you tell a casual acquaintance or a person you just met all the gory details? I’m betting you wouldn’t, and I wouldn’t either. Disclosing your mental illness has costs and benefits and, while it’s a tricky choice, it is most definitely a choice. As a mental health writer, the topic is pretty unavoidable for me. People ask me what I do, and I say that I’m a writer. They ask what I write about, and, eventually the question of how I got into this niche arises. This is where I’ve been able to practice a good deal of tact. It depends on the situation but sometimes I’ll say I have experience in the mental health field or I went to school for psychology, (of course, my degree was conferred by “The School of Hard Knocks”). If I trust the person, I’ll disclose carefully by saying something like “I had a breakdown when I was twenty.” I still won’t reveal the whole truth, that I’ve been clinically diagnosed with a chronic mental illness that lasts my whole life, because the word “schizophrenia” scares a lot of people. 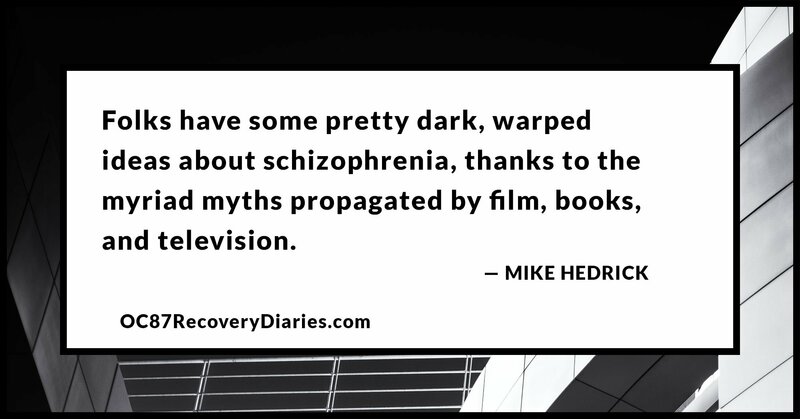 Folks have some pretty dark, warped ideas about schizophrenia, thanks to the myriad myths propagated by film, books, and television. These days I try to be very careful about disclosing my illness. I wasn’t always that way. I would tell new people about my schizophrenia all the time, mainly because, and this is purely speculative, but I think it made me feel as if I had street cred. I also used disclosing as an explanation for why I acted strangely. The truth is I may not have been acting strangely at all but, in my own mind, I was so hypercritical of the way I acted that I needed to explain somehow and probably only to myself. At these points, the conversation would often come to a grinding halt and they’d excuse themselves, rather quickly. 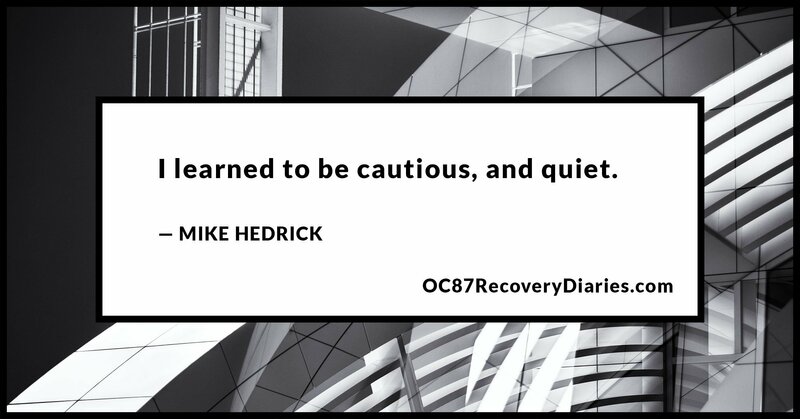 So I learned to be cautious, and quiet. You learn that pretty quickly once a person or two asks you if you’ve ever killed anybody. Your illness is your own personal health concern, just like high blood pressure or high cholesterol. These are both things that you rarely ever tell anybody else about in everyday conversation and, in my view, mental health should be no different. Disclosing your illness is your prerogative and only yours. You may feel like you have to tell people but you really don’t. If people are interested in your life and you get to a point of comfort with them where the subject comes up, you can choose to tell them or not. I have horror stories about failed disclosures including an instance where, on a date, a girl replied by asking if I had ever killed anybody. Another instance found me alone at a bar after an older woman scoffed and went to the other end of the restaurant. It’s also inevitable in any instance of dating when I disclose that the woman I’m with will raise her eyebrows and excuse herself to the restroom after I’ve said the words. You may face rejection in the form of a horrified look or a wide-eyed excuse to get going. You may face a shaky, uncertain future with this person where they are afraid to interact with you or to get any closer to you. You may face disbelief or skepticism that you really are sick because you handle yourself so well. 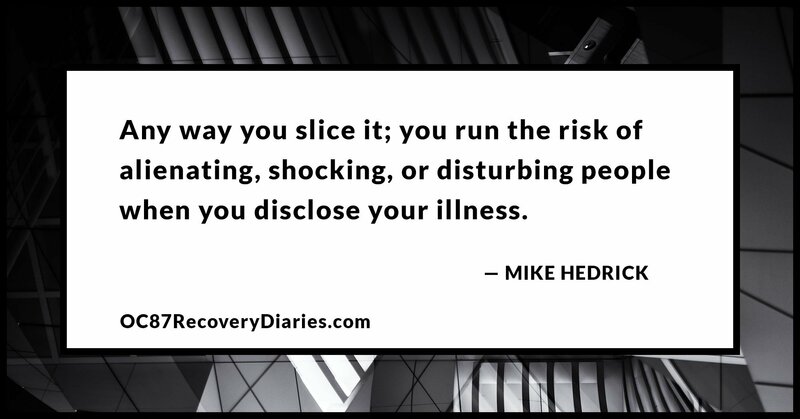 Any you slice it; you run the risk of alienating, shocking, or disturbing people when you disclose your illness. I have also had instances where I didn’t disclose because I knew it wouldn’t end well. 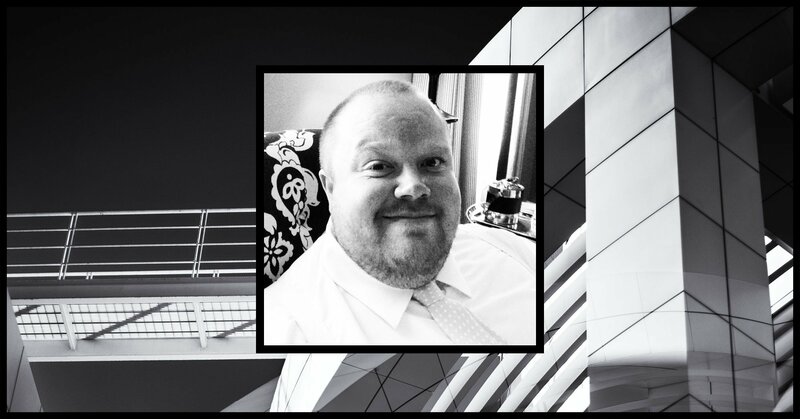 In those instances I have brought up my fascination with neuroscience, behavior, and psychology and usually I and the person I’m with will riff about it for a few minutes. Sometimes we talk about people with mental illnesses and sometimes they will say something like, “Yeah, keep those freaks away from me.” or, “I’m so glad I’m not crazy, those people are horrible.” When you get a response like, that it’s wise not to bring up your illness. The good part is that you know to stay away from those people– people who reveal their ignorance and their prejudice. You can always keep your diagnosis in your back pocket, and pull it out when you need it, as it’s an easy way to get out of a conversation with someone you don’t want hanging around! Just drop the diagnosis, and they’ll be history! 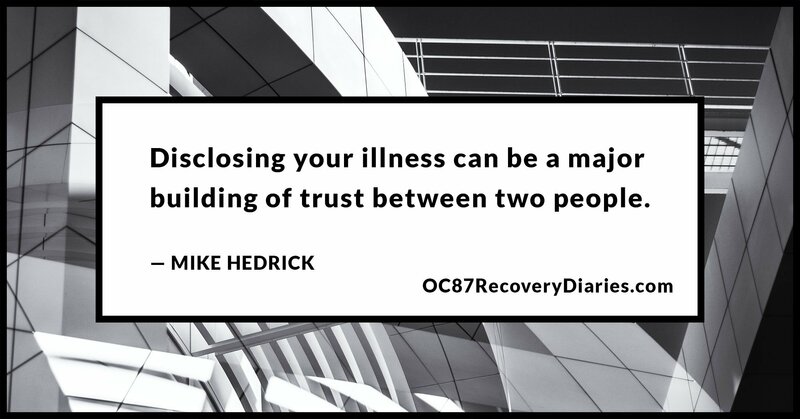 On a more serious note, disclosing your illness can be a major building of trust between two people. Being vulnerable is essential in any strong relationship, and baring your soul about something that affects you so deeply can provide a basis of trust that is hard to come by any other way. There is no prescribed time or duration of a relationship to be sure disclosing will work, you just have to trust yourself that you’ll know when the time is right, if it is at all. Being guarded about your illness is perfectly understandable. You probably wouldn’t tell someone you just met that you just got out of the psychiatric hospital, because that can feel like a point of shame. It shouldn’t, though. Hospitalization is empowering because it’s a sign that you’re taking care of yourself. Unfortunately, some people still might see that as some sort of inherent weakness, as if you aren’t strong enough to handle yourself in the real world, but nothing could be further from the truth. The fact is; you’re stronger than most. Like a performer at a comedy club, you have to know your audience. You have to know social graces and nuances of human relationships, and that takes time and practice. Judging the dynamics of each situation is important and, while it may be hard to do at first, you will tease out the right times and the wrong times to tell someone you have schizophrenia. Sadly, this is just one of the social complications people like us face and remember that you don’t have to tell anyone you don’t want to tell, especially if you’re not ready.